In part one of looking back at the off-season, we covered running backs who saw their ADPs rise over the summer due to the situation around them. We wanted to learn why some have proven to be worthy of a climb and why some have fizzled out leaving their owners distraught. Building a strong roster takes time, but we often forget this when we fall in love with the latest potential breakout superstars. It is often the players who we are not thinking about who can become future centerpieces of our teams. So after looking at big risers, I identified some off-season fallers. More often than not, there are obvious and logical reasons for an ADP drop (suspension, injury concerns, change of team etc), but the most important thing I try to understand is whether or not the off-field things will affect on-field play. If they fall because of football-related reasons or performance, I believe it is justified, but when I see off-the-field issues, there is a chance to take advantage. Gordon was the most obvious absentee from the top 50 players in August due to his uncertain future, but if you drafted him in the fifth or sixth round of a start-up, you’re probably pretty happy right now. He is already regaining his value and could make a huge contribution to winning seasons this year. FYI: Josh Gordon dynasty ADP back up to 28, slotted between K Allen & Rodgers, as he nears his return. The 2014 rookie receiver influx allowed you to avoid him or move him for some great replacements, but I could never justify taking players over him with similar August ADPs (Andre Johnson, Roddy White, Terrance Williams or Eric Decker). 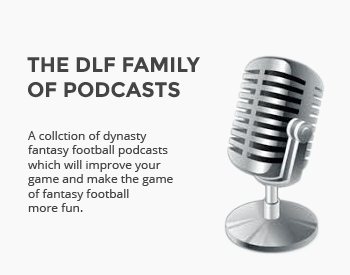 In the latest DLF newsletter, Ryan McDowell identified patience as one of the biggest keys to dynasty success and we should always show some with guys of his talent level.